Is the Murrell Green new settlement viable? We wrote yesterday that the council has prioritised the Murrell Green new settlement as part of the Hart Local Plan. However, there are very real questions about the viability of these proposals. Houses are obviously taller than solar panels, and indeed some houses might have solar panels on their roofs. So, how can it be sensible to build houses when solar panels were deemed inappropriate? It is not appropriate to build houses on this type of land. Nor should it be promoted as green-space for children or dog walking when we don’t know what toxins lie beneath. It should also be noted that a 110kV electricity transmission line traverses the site as well as a high pressure gas main. Hardly appropriate for housing or recreation. The site is also within the Thames Valley SPA 5km zone of influence. There are three Sites of Interest to Nature Conservation (SINC) on the site plus a further SINC just to the west at the River Whitewater. Finally, there are a number of public footpaths that currently criss-cross the site and they appear to be destoyed by this new proposal. The only access to the south of the proposed Murrell Green new settlement is Totters Lane. This is single track in places with a very narrow bridge over the railway. To the north there is the A30 which is already very busy, with choke points at Phoenix Green, Hartley Wintney and the roundabout in Hook. It is difficult to see how these choke points can be alleviated. Those of us who use Winchfield station know that the car-park is frequently full to capacity and of course, the whole line to London is running over capacity. The idea that either Hook or Winchfield stations can accommodate the extra passengers from thousands more houses is simply laughable. The proposed site abuts the south western boundary of Hartley Wintney parish and is close to what are currently quite widely spaced houses. The western side of the Murrell Green new settlement comes within a couple of hundred metres of the new development to the NE of Hook (sites 1, 2 and 3 on the image above). Note that sites 4 and 126 on the map above are not (yet) included in the new settlement proposal. In essence, we are creating Hartley Winchook. Last year, it came to light that there was a ‘secret plan‘ for a very large settlement that included both Winchfield and Murrell Green. The Murrell Green part of the proposal was promoted by a company called Pearson Strategic Limited. Its only real asset is promotion rights over Totters Farm that has been mortgaged under a fixed and floating charge to Monopro Limited. One really has to question whether we should be building the Hart Local Plan around a site with such little backing. Accounts to Pearson Strategic can be found here. Fixed and Floating charge document can be found here. Some Hart Councillors seem hellbent on a new settlement regardless of the suitability or viability. In addition, they have not challenged the new Strategic Housing Market Assessment (SHMA) hard enough. If we are sensible about the housing targets and get properly serious about the brownfield opportunities we don’t need a new settlement anywhere in Hart. Time to make our voice heard again. Posted in Hart District Council, Hart Local Plan, Hartley Winchook, We Heart Hart Campaign, We Love Hart Campaign and tagged Brownfield Sites, Hart District Council, Hart Local Plan, Hartley Winchook, Hartley Wintney, Hook, Infrastructure Costs, Murrell Green, Odiham, Pearson Strategic, SHMA, We Heart Hart Campaign, We Love Hart Campaign, Winchfield. what?? Who is randomly selecting numbers because this would need serious justification. The National Planning Policy Framework states that Local Authorities should have a positive strategy to promote energy from renewable and low carbon sources. In August 2014 Hart District Council published a Sustainability Appraisal of Housing Development Options. 21 development objectives were specified including: protecting and enhancing the health and wellbeing of the population, increasing energy efficiency, security and diversity of supply, promoting the use of land through the appropriate re-use of previously developed land, improving the efficiency of resource use and achieving sustainable resource management. Trimmers Solar Farm will meet 10 of these objectives without having to build a single house. Rob Titherley, your posts are fine with me. 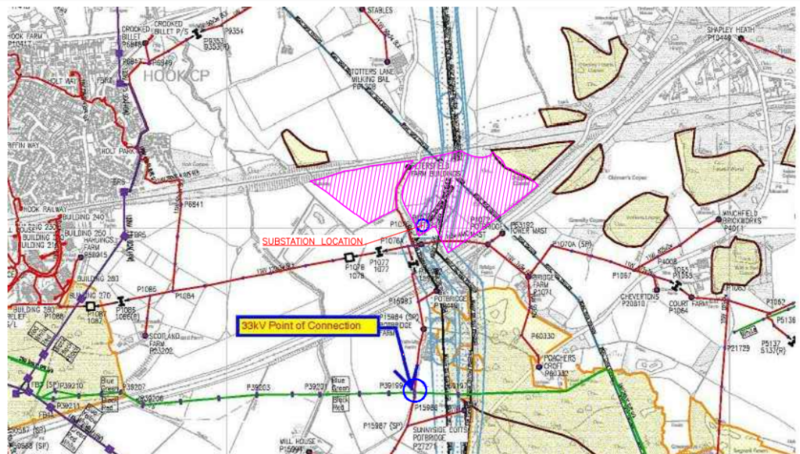 Presumably there will be full disclosure of the underground national high pressure electronically protected gas main that runs north/south 1½ metres under the entire plot from Potbridge to the A30. I can recommend the view of the 110kV pylons and power lines, but to be fair I am an Electrical Engineer so I like steel structures, electrical radiation and strong magnetic fields. Our schoolchildren are now being told they can’t go out to play because local air pollution (aka poison gas and carcinogenic micro particles) levels are too high yet here we have housing built right next to the M3. How many houses are being proposed for this new settlement? Surely it would not take enough housing to warrant a secondary school? 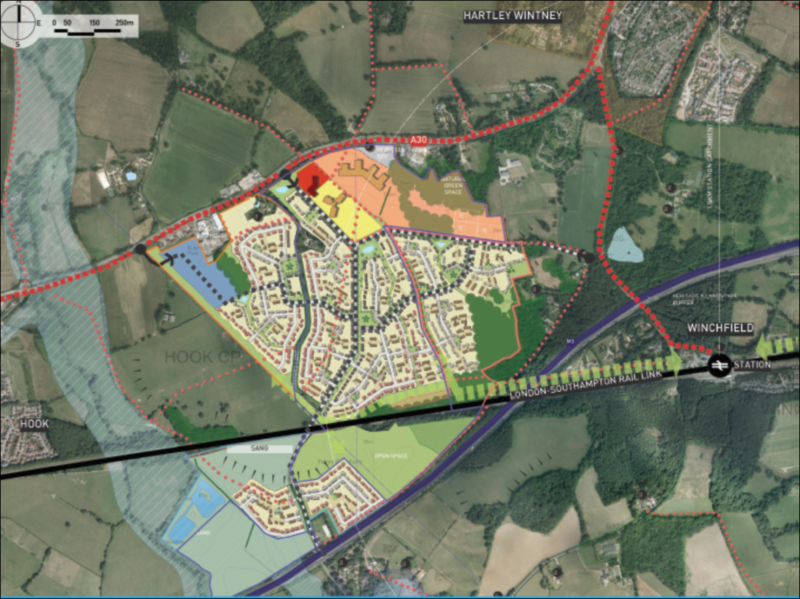 CCH doubles down on Winchfield new town bias | We Heart Hart on Local Plan Examination: Heads Must Roll! Council to remove Winchfield new town from Local Plan | We Heart Hart on Local Plan Examination: Heads Must Roll!